This is one of my favorite cakes. It is easy to make, and a great idea for a planned-over sweet potatoes. I love looking for new and interesting mixed, dried fruits. Instead of plain raisins, I used a golden berry mix which included; raisins, cranberries, and blueberries. When you need to have the oven on for at least an hour, add a couple of sweet potatoes. Scrub them, oil the skins and set in a shallow baking pan while you are cooking "whatever" for about 1 hour. After they have cooled, peel them and place the flesh in a plastic bag and tuck it in the refrigerator. 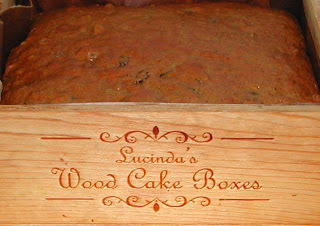 Pour into prepared Lucinda’s Wood Cake Box. This cake is a great cake to ship. It gets better after several days of "maturing" and travels well. 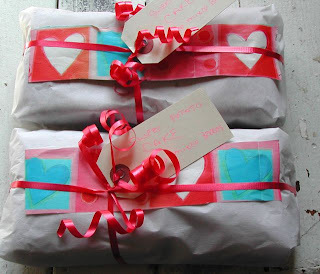 Send one (or two) out to someone you love!